The start of the academic year has seen the opening of Castle Block at Concord. The two storey former science block, which stands in the shadow of the beautiful Acton Burnell Castle, has been given a major re-imagining and re-modelling to provide state-of-the-art classroom accommodation for three academic departments. English, Economics and Art now come together under the same roof following completion of the nine month renovation project in readiness for the start of the new school year. 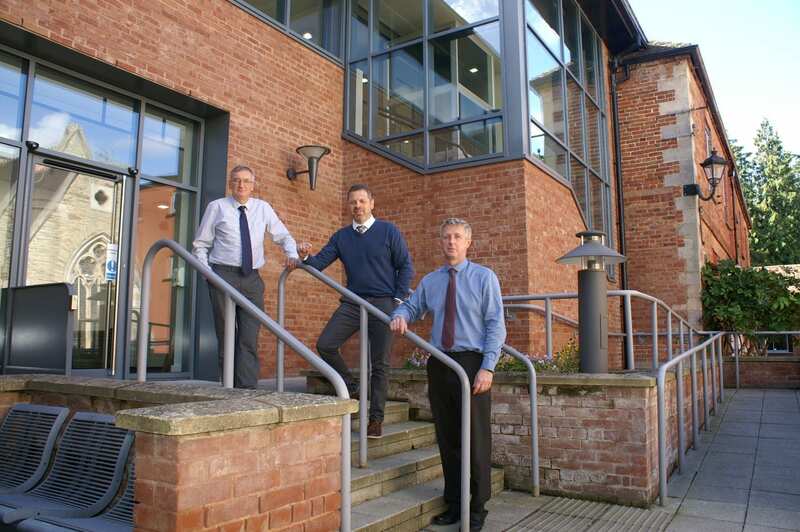 The Heads of Department, Mr Anthony Hudson (Art), Mr Phil Woods (English) and Mr Clive Webb (Economics and Humanities), have been speaking of their 'delight' at being housed under one roof. The transformation of the 1,100 square metre Castle Block, which houses 19 classrooms, three departmental offices and other facilities will benefit both students and staff. For Mr Hudson it is a move back to the heart of the campus after many years of teaching art at an off-site location in the village of Acton Burnell. "We have left an inspiring environment for an equally inspiring environment with the benefit of gaining increased teaching time," he explained. "Art is a visually strong subject and I feel the move will help us to better tailor what we do for students' ambitions, particularly for those who are interested in following a creative pathway." The Art Department, which has three teachers, has a total of four studios, one of which is dedicated to photography. All Year 9 students study art and in addition the subject attracts 20-25 studying for GCSEs and up to 12 A Level. The suite of subjects on offer range from fine art to photography, 3D, fashion and textiles. The English Department is 14 strong, 10 of whom are full time teachers. Said Head of English, Mr Woods: "Every student will come through the department at some point and four of our eight new dedicated classrooms can be opened up to provide flexible learning space, whether for lectures, debating or performances. "We also have a classroom which will serve as a tutorial room so that we can work on students' speaking skills. I felt the department was previously very disparate, but now has a stronger sense of identity which is a real luxury. "We are at the heart of the school and very close to the library resources. The Castle Block gives the opportunity for the three departments to move forward more closely together." Economics has six classrooms of variable sizes and seven members of staff. Said Mr Webb: "The new area will mean all Economics teaching will be in one place allowing us exciting opportunities for collaborative working. The flexible teaching space and state-of-the-art classroom technology gives a terrific teaching and learning environment. "The Economics Department intend to make full use of these opportunities and create an identifiable space where students can access the full range of teaching and learning resources for this great and dynamic subject." And the three Heads of Department were unanimous in their praise of the building which provides a new working environment to meet their collective needs. "For each department, which looks at educating students in a similar way, the move has given us a strong new individual identity as we can now work together in one block. "It is a fantastic building in a beautiful setting and is one in which we can broaden our students' perspective in this ever-changing world. It will help us create greater collaboration and provide our students with the skills they need to take them on to the next stage of their education." Said Concord Principal Mr Neil Hawkins: "To my mind this is a new building. It is one which has been re-imagined and re-modelled so that there is greater cohesion and rationalisation for English, Economics and Art. "I am confident it will focus strength among the departments across the school and at the same time foster departmental identity for everyone."